The countryside surrounding Banstead provides a fair range of habitats with one of the commonest being woodland/copses containing a high proportion of Hazel (Corylus avellana)trees often showing evidence of ancient coppicing. Indeed my own and neighbours gardens in the middle of Banstead contain large old coppiced Hazels with associated flora including Ramsons (Allium ursinum) and and Lesser Celandine (Ranunculus ficaria). 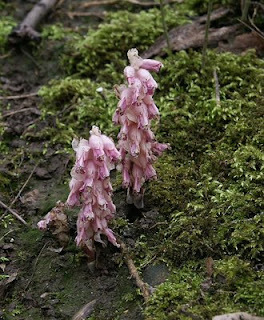 Now whenever I come across Hazel coppice especially in the spring I look forward to the possibility of seeing Toothwort (Lathraea squamaria) a parasitic species most commonly on Hazel although it has been known to attach itself to Ulmus species if it can find any! 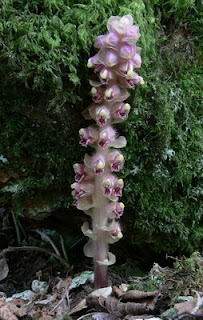 Being an obligate parasite it contains no chlorophyll and the flower spikes appear straight out of the ground with the flowers varying in colour from white through to deep purple. 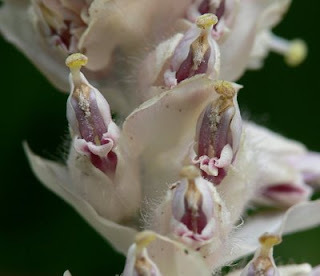 It is a rather attractive plant that often suffers from weather damage because of its early appearance from March onwards. I have seen it growing in many places in the UK, usually on limestone and locally have seen it on Epsom Downs and Headley Heath (top picture). So far however I have failed to find it in or around Banstead despite the abundance of its host. I shall keep looking. A couple of years ago we visited a well known colony of this plant in the Purbecks, Dorset. We were lucky enough to find plenty of plants in unusually pristine condition and this enabled us to appreciate their true beauty and to get some half decent photos (bottom two). Who knows, one day Banstead! Interestingly a friend of mine managed to get this species to grow on Hazel in his garden by sowing seed directly onto a damaged Hazel root. I think this is more commonly done succesfully with the other (introduced) species to be found occasionally in this country, L.clandestina. This species is native to SW Europe and is parasitic on Salix and Populus species.